"Little Brothers of St. John the Baptist pronouncing their final vows"
Little Brothers of St. John the Baptist pronouncing their final vows. Bp. Sun seating with altar at his back; Fr. Raymond de Jaegher to his right; Fr. 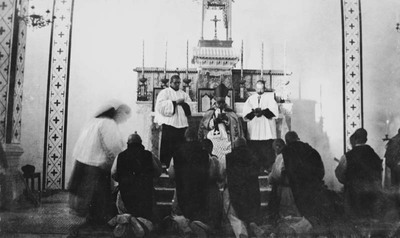 Vincent Lebbe and for Brothers kneeling in front of the bishop. Little Brothers of St. John the Baptist pronouncing their final vows. December 24, 1933. Société des Auxiliaires des Missions (SAM) China Photograph Collection, Whitworth University Library, Spokane.